← Dictionary Leaves (leevz) n.
This trendy design is inexpensive to create and the cinnamon gives the gift a nice holiday scent. Now that Thanksgiving is over it’s time to start thinking about the holidays. While you are still feasting on your turkey leftovers, it’s a good time to start gathering items to wrap your holiday gifts. I remember the days when I would spend $80 to $100 on decorative wrapping paper to make my gifts look unique and beautiful. Everyone would always say “Gina always wraps the best gifts!” I have come to realize that the most interesting gifts do not have to be created with fancy, pricey wrap and embellishments. Some of my favorite designs are wrapped with reused items and natural elements like this shopping bag wrap. The sooner you start getting your supplies together the less money you will spend on gift wrap. You can even start making some of your gift bags and pre-wrapped boxes in advance. Over the next few weeks, I will be posting design ideas and tips on how to save money wrapping gifts this holiday season. This entry was posted in Gift Wrapping, Uncategorized and tagged cinnamon sticks. 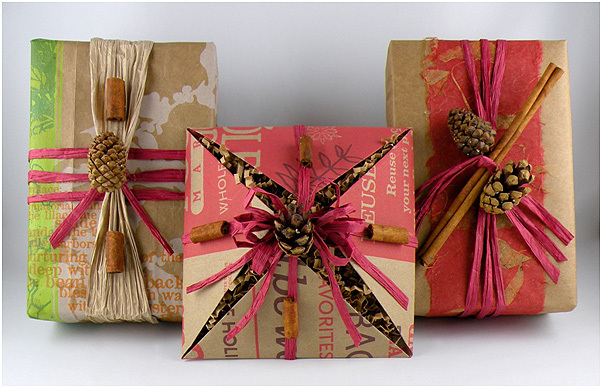 reuse, eco friendly, gift wrapping, Gina Tepper, Holidays, pine cones, recycle, shopping bags. Bookmark the permalink.